History has been kinder to the American generals of World War II-Marshall, Eisenhower, Patton, and Bradley-than to the generals of the wars that followed. Is this merely nostalgia? Here, Thomas E. Ricks answers the question definitively: No, it is not, in no small part because of a widening gulf between performance and accountability. During World War II, scores of American generals were relieved of command simply for not being good enough. In The Generals we meet great leaders and suspect ones, generals who rose to the occasion and those who failed themselves and their soldiers. Marshall and Eisenhower cast long shadows over this story, but no single figure is more inspiring than Marine General O. P. Smith, whose fighting retreat from the Chinese onslaught into Korea in 1950 snatched a kind of victory from the jaws of annihilation. But Smith's courage and genius in the face of one of the grimmest scenarios the marines have ever faced only cast the shortcomings of the people who put him there in sharper relief. If Korea showed the first signs of a culture that neither punished mediocrity nor particularly rewarded daring, the Vietnam War saw American military leadership bottom out. In the wake of Vietnam, a battle for the soul of the US Army was waged with impressive success. It became a transformed institution, reinvigorated from the bottom up. But if the body was highly toned, its head still suffered from familiar problems, resulting in tactically savvy but strategically obtuse leadership that would win battles but end wars badly. 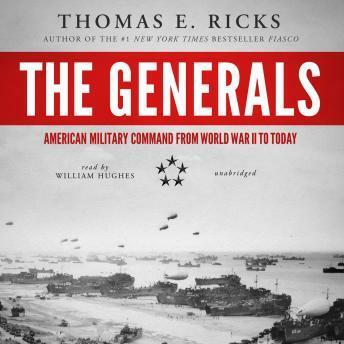 Ricks has made a close study of America's military leaders for three decades, and in his hands this story resounds with larger meaning: the transmission of values, strategic thinking, the difference between an organization that learns and one that fails. Military history of the highest quality, The Generals is also essential reading for anyone with an interest in the difference between good leaders and bad ones.